If you listen to our podcast, you’ve probably heard us talking about how the office just hasn’t been working for us. Chris left his office job in June of 2016, and it was right after that when we really started working on it and planning everything out. I had this grand idea of the two of us spending all of our time in that room, working and growing our little business. And while the working and business growing has definitely happened, it hasn’t been in this office. Mainly because of the standing desk we built out of Ikea cabinets and a large slab of Formica. Because we are both taller than average (6’4″ and 6′), the desk had to be especially tall, too, and stools that were tall enough, so we could sit occasionally, were very difficult to come by (and not very comfortable which made me not want to work in here for long periods of time). A standing desk is great in theory, and we totally understand the benefit of it. Before Chris left his job, he had a Veridesk at work and it was a huge help to his back. Standing nonstop can actually cause pain in your ankle and knee joints, so the beauty of the Veridesk is being able to go from sitting to standing position in only a few seconds. But I gotta be honest, the thing is a bit of an eye sore and didn’t really fit the feeling we wanted in the office when we were initially designing it. And as it turns out, with what we do, we don’t sit for long–especially Chris. There’s always something to measure, move, hang or unbox. So for us, we decided we needed to nix the standing desk and just make our sitting time as comfortable and efficient as possible. 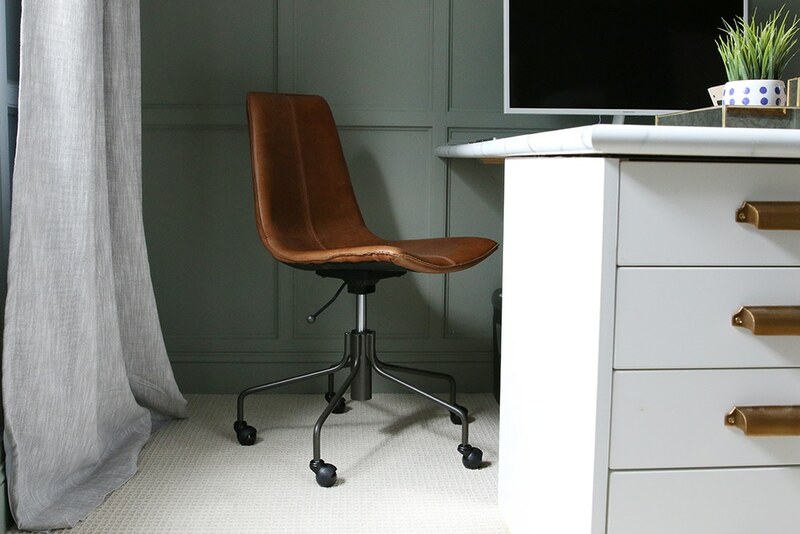 Besides buying new chairs, we wanted to simply work with what we had. So this past weekend, Chris cut the whole standing desk thing down. 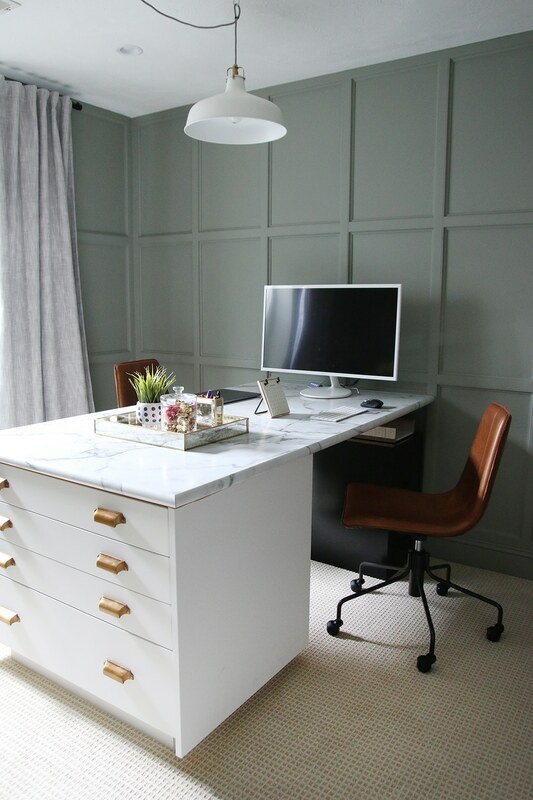 We built the desk with IKEA kitchen cabinets (check out the tutorial here). 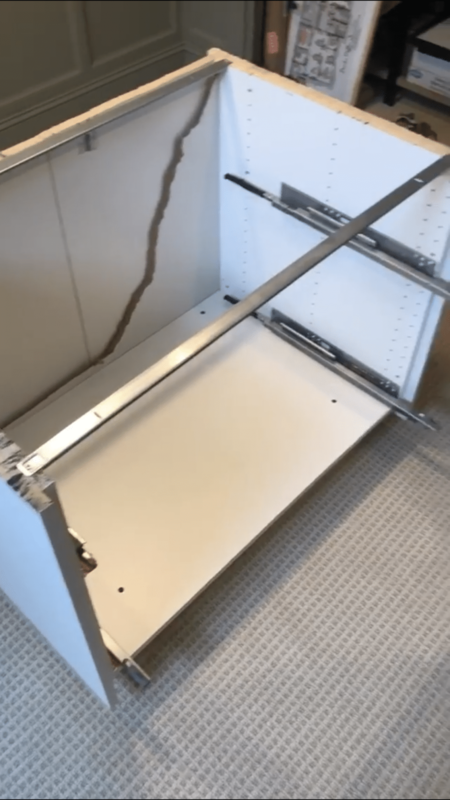 Chris actually took an above-the-fridge cabinet, cut it to a custom size, and attached it to the top of a standard base cabinet. This gave us a perfect standing height. But for sitting, just removing the top section wasn’t going to be enough. 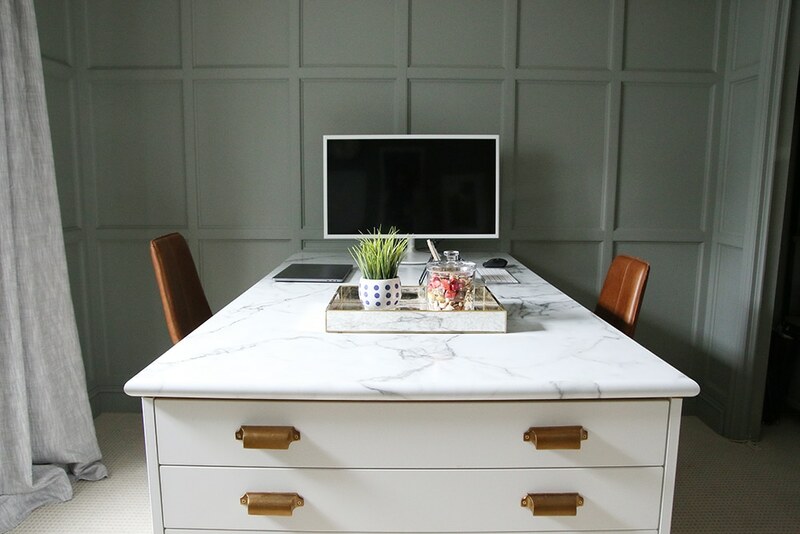 A standard desk is between 22 and 25 inches, whereas kitchen cabinet are 30. So with a quick measure, mark and run of the reciprocating saw, we took the cabinet down to the perfect 25in height. It’s amazing what lowering the desk did for the room overall. It just feels so much more open! And when we saw how open it became, we just wanted to keep that going. When you walk in the room, the above is what you see first now. We used to have a small shelf on the wall where the art is, with our printer and some other supplies (below). Though functional, I didn’t fully realize just how cramped that was making the space feel. 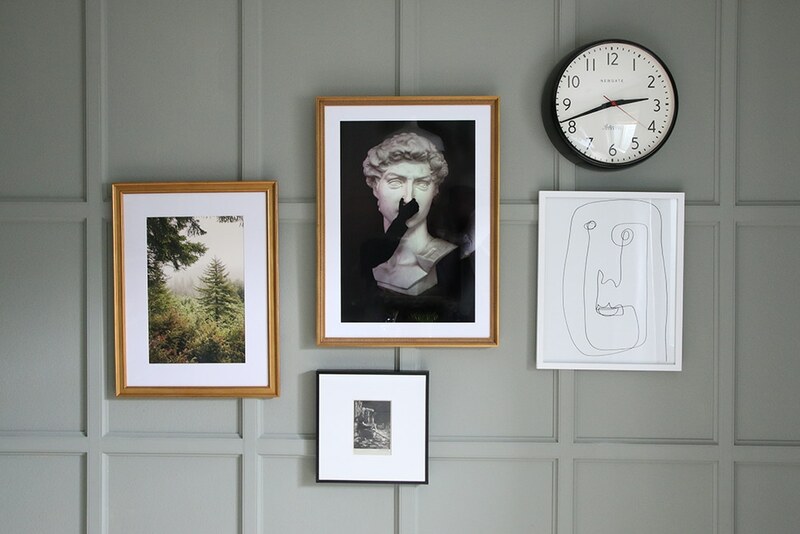 But once we moved it out and hung some art, it was like I could finally breathe! Plus, art has always been such a creative boost for me. As for our printers, we cleared out some old items on the shelves in the closet and put them there. Perfectly accessible, but tucked away. We weren’t sure if the open closet storage was something we could live with long term in here, but I’m happy to report, for us, it’s been perfect. I’m constantly swapping pillows, grabbing paints swatches and supplies and now with our printers in here–it feels more functional than ever. For more office realness, there’s a filing cabinet and little trash bin tucked under our desk. 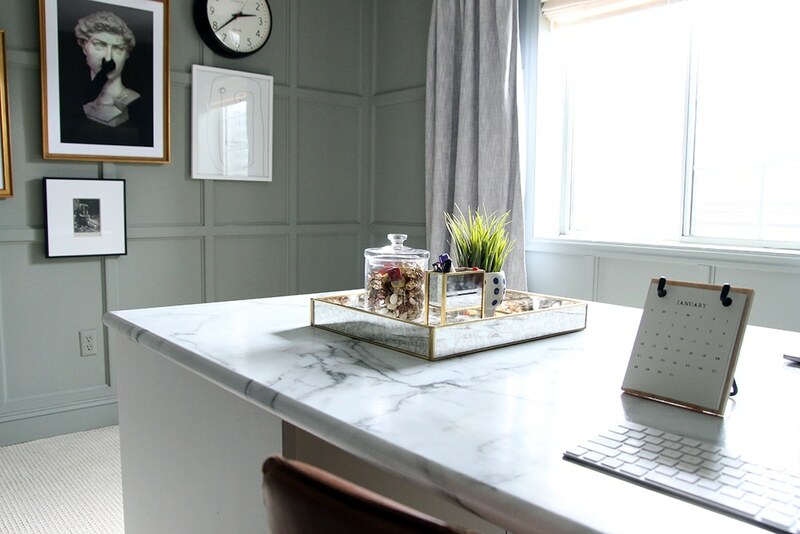 A lot of times I see beautiful office spaces where I start to wonder where those kinds of things are–printers, filing cabinets-heck, cords!–this is definitely a working office. One question we often get is, why don’t we just turn the reading room upstairs into a full blown office? Behind the scenes, there are a lot of conference calls, interviews and Skype sessions with major brands and corporations where it feels necessary to have a place tucked away from everything, where we can shut the door. This room is really perfect for that right now. Our monitor was previously mounted on the wall with a swivel arm. Though convenient, we found it to be a bit unneeded, and by adding the stand back to the monitor we’re able to move it wherever we need – even out of the way if we need to spread a flat lay out. Another addition to the room are the gray drapes. They hung in our guest room previously, but on a whim I asked Chris to hold one of the panels up to the office window and I just had to have them in here. They add such a nice softness and I once read that if you don’t have the best view outside your window, non-white curtains will help detract from that. Outside this window is a window well and I can already tell you, I don’t even notice it as much with these curtains hanging. When we were sharing on Instagram, over the weekend, that we were changing a few things in here, there were some people that had a hard time understanding how, within a year, we already were changing a room that we had checked off. While all of our spaces are constantly being tweaked over time, my philosophy is, even if you spent time, money and energy on something, if it’s not working for you then what’s the point?! Your home should absolutely function for your needs. And fortunately, for us that just meant a day of cutting down and re-working something we already had in place and buying new chairs (which, twist my arm). Home Office 2.o feels right. I find myself able to focus so much better on the growing list of tasks that come with running a business from your home. And while we’ve said it before, I think that this time we’ve finally figured this office out, and I can’t wait to see the ideas, designs and projects that come out of our time spent in here. 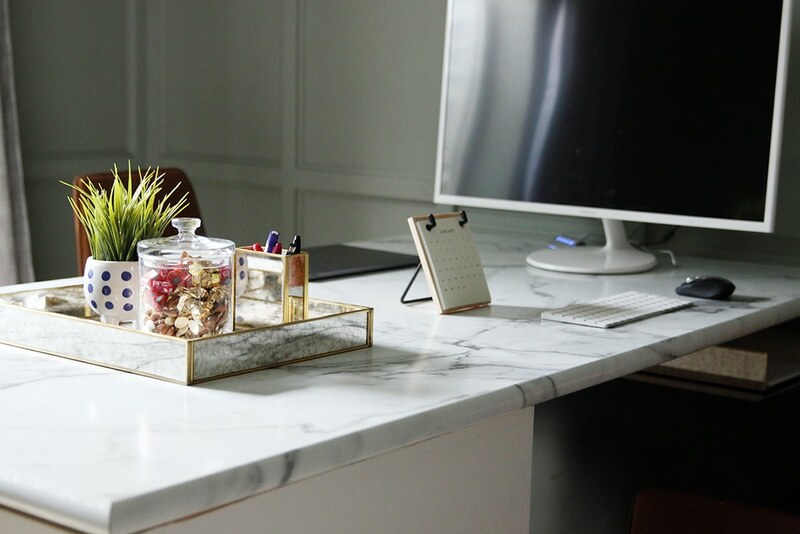 Loved the home office 1.0 and the 2.0 even more :) Can you please tell me what the dimensions of the laminate desktop are? I can’t seem to find them anywhere. Gorgeous! 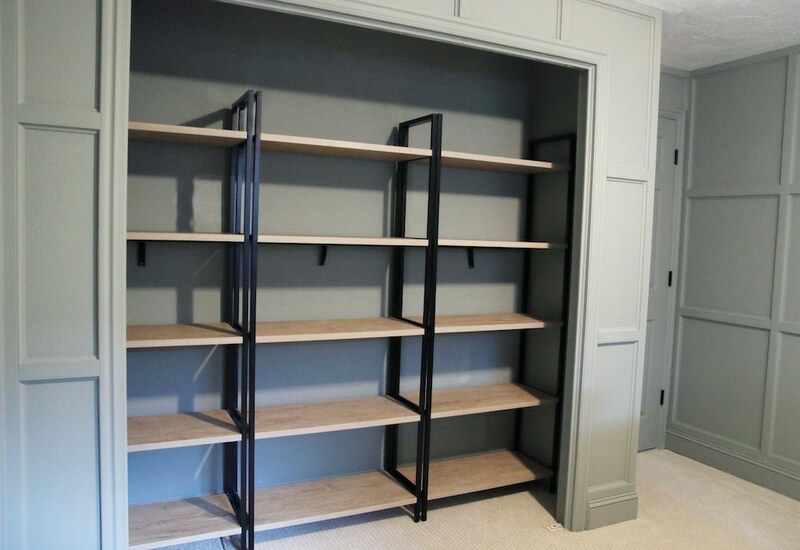 What are the shelves you used in the closet? We bought them from Target a couple years ago. I love the way your office looks! But I always wonder how practical long hanging curtains like those are. Surely this way the curtains just collect more dust/filth, or get tread on? How do you find these to live with practically? Eh, this room is really low traffic and over carpet, the curtains don’t look dirty at all at the bottom. But every household is different. 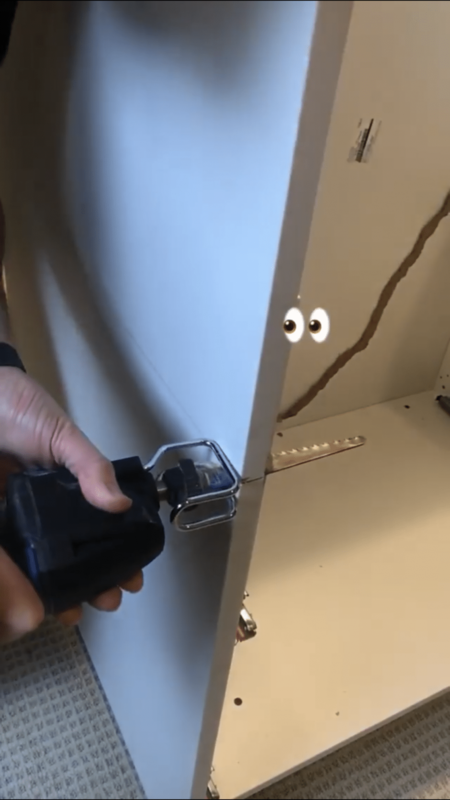 Did you guys mount the countertop to the wall or is it being help up simply with the drawers on the other side? I’m loving this desk and hope to make one myself soon! There is a piece of wood against the wall, too! 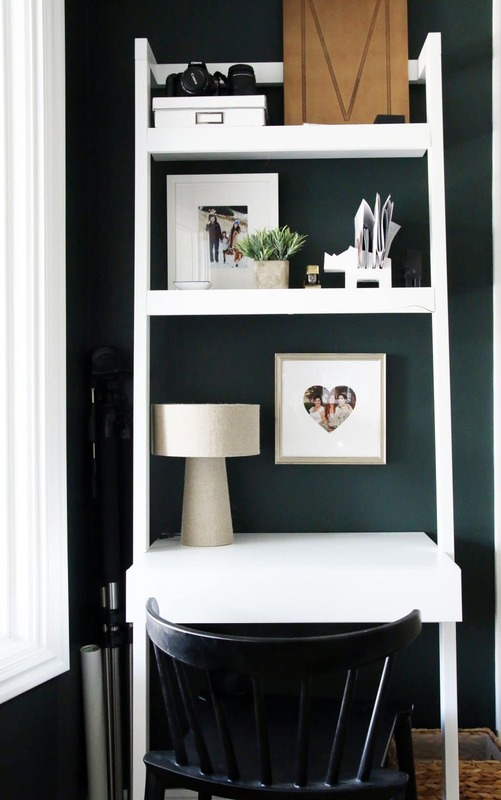 LOVE hearing about changes in a room you’ve recently redone. Homes are always evolving and growing and shifting with our lives and as other commenters have said, it reassures everyone that it’s possible to keep it all moving and making everything fit as life changes and happens. No biggie! This looks great! That office chair is beautiful. And I love following you guys because you always keep it real: it didn’t work, so you changed it. It makes me less afraid of trying something when I see that even professionals change it up sometimes. Thanks for always chronicling everything for all of us to see! I’ve always loved your office but now I love it even more! Those West Elm chairs are uhmazeballs! What do you think about the laminate marble? We have green laminate in our kitchen and while I’d like to redo our kitchen, it’s not happening while we are paying off a fence and huge patio reno. I was thinking a marble-looking laminate might satisfy me for the next several years but don’t want it to look cheese. We really like it. I think it’s a great, budget-friendly alternative. See more photos here. I have a marble laminate (from home depot!) in my kitchen and LOVE LOVE LOVE it! It looks SO beautiful and convincing and I don’t have to baby it or worry when I’m a super messy and careless cook. I wanted the marble, but it’s awfully $$$ and it just wasn’t in the budget at the time. QUITE pleased with the faux stuff myself though. I love this idea! Thinking of building my own! Just to clarify – you cut the cabinet box down to 25″ but still have a 4.5″ toe kick and 1.5″ countertop – making the total desk height 31″?? Thank you for all of your inspiration! I love the changes you made! 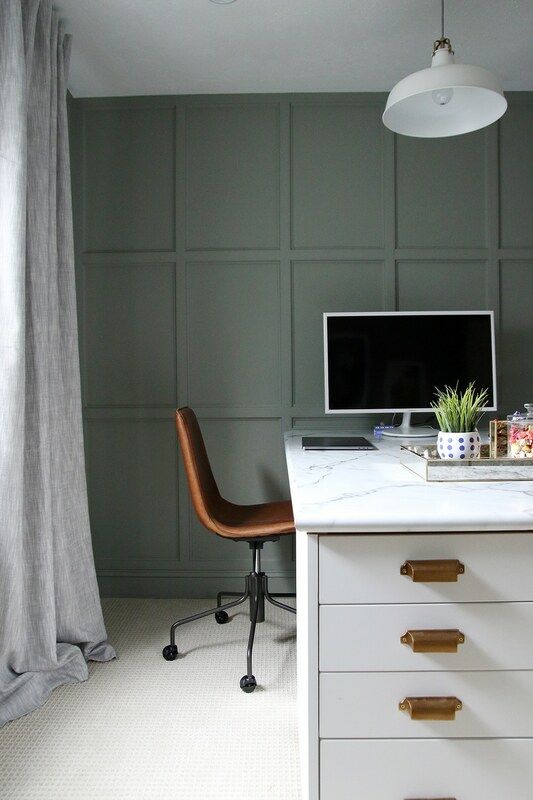 The desk, the curtains, the artwork, the chairs, and moving the printers… all of these tweaks have made this room go from nice, to excellent! I think it just needed some coziness and all of that just upped the coziness by a lot! I know you said it feels more open to you in person, but from the pics, to me it just feels more cozy and welcoming. Just has a little more warmth and personality now. Whoever was surprised that you were making changes within a year, well… I wholeheartedly agree that if a room isn’t working for you, then keep tweaking it until it does! This seems especially true for an office where you’re trying to be productive and make a living. 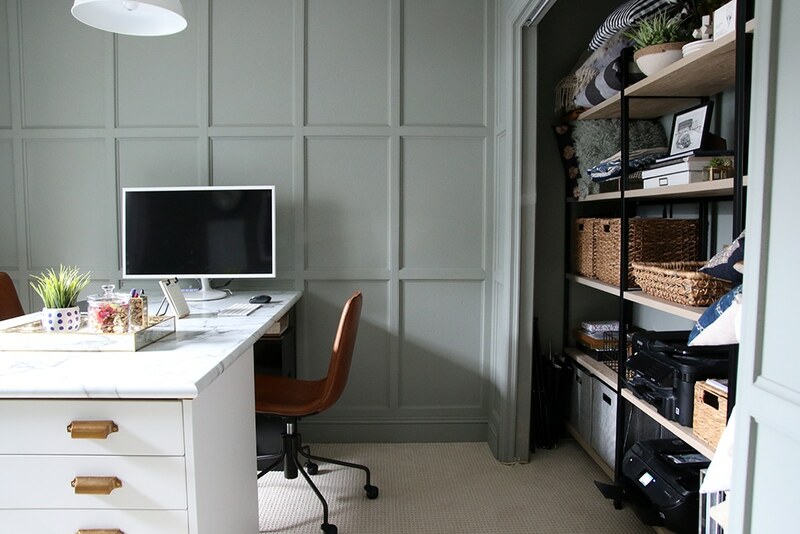 I know I need to make some changes in my home office where I spend hours upon hours every day. There are some frustrating aspects that bother me every day. What the heck am I waiting for? Sheesh! Sometimes we wait because it feels like it has to be this big thing. But really, it’s often just a few little things. This looks great! Love everything you’ve done. Question for you – did you have an outlet in the closet already for the printer, did you have to add one, or are you using an extension cord from another outlet in the room? I love a functional closet with the printer and everything in it, but there are usually no outlets! Thanks! There wasn’t! Chris ran an extension cord from under the desk, right under the baseboards and into the closet. I was so happy I couldn’t see it except right in the closet opening. I think the office turned out great! I like that you tried the standing desk but realized when it didn’t work out you were not afraid to change it up. Nice job! 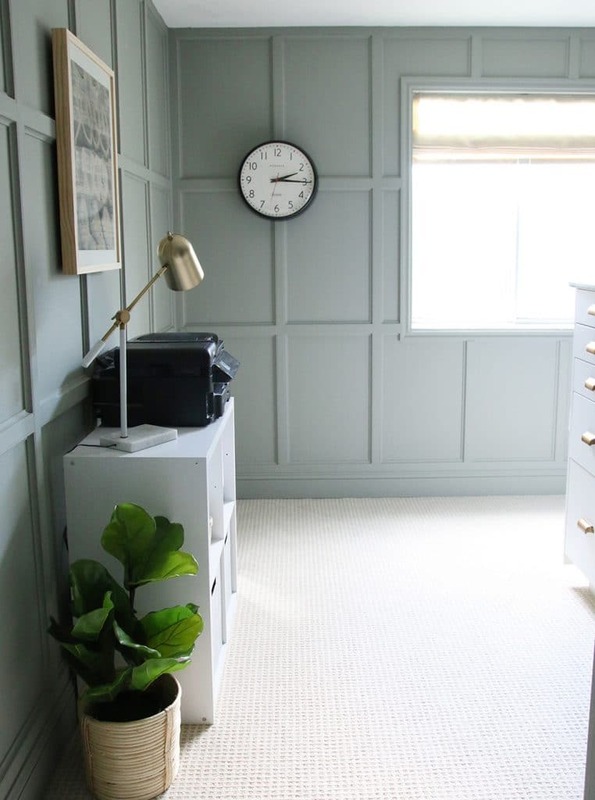 Farrow & Ball Pigeon is a beautiful color for this space. I am looking to repaint our bathroom. Our first bathroom is all neutrals which I love. Our other bathroom I always like to be a color. I think Pigeon would fit well with our color scheme perfectly. The only problem is we do not have Farrow & Ball anywhere near us. Could you name some other paint colors that are very similar in either Benjamin Moore or Valspar please? Holy crap! 25 inches? How do you get your legs under there? We just moved to a new office and every desk, pedestal, set of legs we found was between 28-30 inches. We went with 28, and it’s waaaaay too short for me! Keep us updated! Loved it before but love it even more now! Also glad to see that even the pros have to rework things from time to time- I’m trying to explain to my husband that reworking a room (I NEED a new sofa sitch!) is sometimes necessary, not just fickle. But somehow “Chris and Julia do it all the time!” Means nothing. 🤣 anyway thanks for keeping it real! It’s beautiful! It feels so much better all around! I loved the original office design and I love the 2.0 version! I completely agree- what is the point of having something look good, but its just not functional or working for your family?! A good lesson for all of us: that it is ok to make mistakes and tweak things as you go and don’t feel horrible if you don’t get it right the first time! Good on you! Looks amazing! Quick question: do you normally paint over outlets? Does it effect functionality? We usually don’t, but they were really distracting to the vibe in this room. So long as you don’t have an over-saturated brush that deposits paint deep into the socket, you’ll be ok. We use an almost dry brush and do several light coats. HI! I may have missed it, but I would like to know where the gold frames are from? Thanks! The tree print came framed, I had Knuba framed through framebridge. Are Farrow and Ball colors able to be color matched at Lowes/Home Depot like BM colors are? This one is so beautiful! I’ve had luck with SHERWIN WILLIAMS! I matched it at SW and it was beautiful! I noticed that you painted over your outlet covers, and not just the covers but the “outlet holes” too. Didn’t know that you could do that, any advice or precautions I should take before painting mine? I apologize in advance if this is a very stupid question. Not a stupid question at all. Just use the same wall paint and use a nearly dry brush (only a tiny amount of paint on it) to do several light coats until it’s even. If there’s too much paint on the brush it can pool up in the holes – don’t want that. Thank you soooo very much for normalizing my nearly obsessive need to paint outlet covers AND the outlet holes in my home. As I’ve tackled painting one room and then the next, I have painted both (even though my painter and contractor told me not too but without giving me a worthy explanation) but I have always felt slightly uneasy about it -until now. Thank you! This is great-shows how our homes are always evolving, our family’s needs always changing, and for me, my taste is ever-shifting! I tweak and reorder and move and come up with new systems all the time at my house. Who cares if you once “checked it off” I would hate to think we live in museums that can’t change! It looks beautiful! Love the changes. Question. I know you had mentioned a few times on the podcast that being in the office would trigger feelings of nausea related to the time you spent in here remodeling while you were in the sickest part of your pregnancy with Polly. Has that improved? I was thinking that making some changes to the look of the room may have helped? Thanks, as always, for another great post! I’ve spent enough time in here by now that it’s better, but the guest room still does. Here’s a question, and I suspect the answer is quite variable, but at what point do you just decide that there is no way you would ever spend “that” much money on a certain item? We love the dining version of your desk chairs, have ever since we saw them in person on a weekend trip, but my husband thinks that’s a ridiculous amount to spend on dining chairs. It has nothing to do with whether or not we can afford them and everything to do with what is personally valuable. I guess unless you are so wealthy that you never look at prices, everything has a limited amount of how much it is worth to you. It’s just not worth a splurge to him, whereas it might be to me. Gotta love marriage (and I do)! Angela, we looked at those same dining chairs from West Elm. I was concerned about wear and tear with my kids. I ended up buying a look alike from Amazon, $99.00 for two! They look very similar to the West Elm chairs and the CB2 leather dining chairs. Just another option, that are really comfortable too. Search Amazon for Roundhill Furniture vintage leather dining chair. 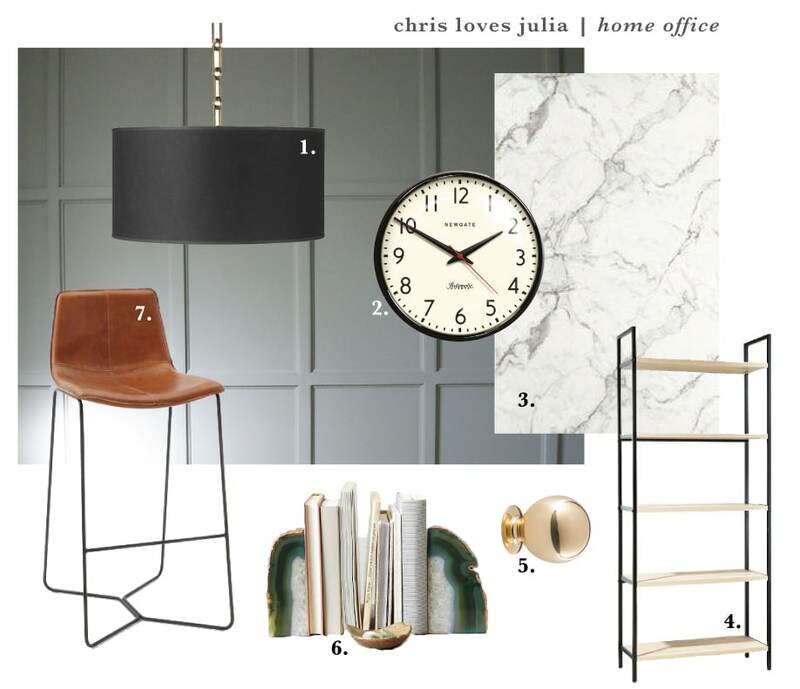 You know what I love – this refresh totally goes back to your original mood board! Those were the chairs you always wanted in there! 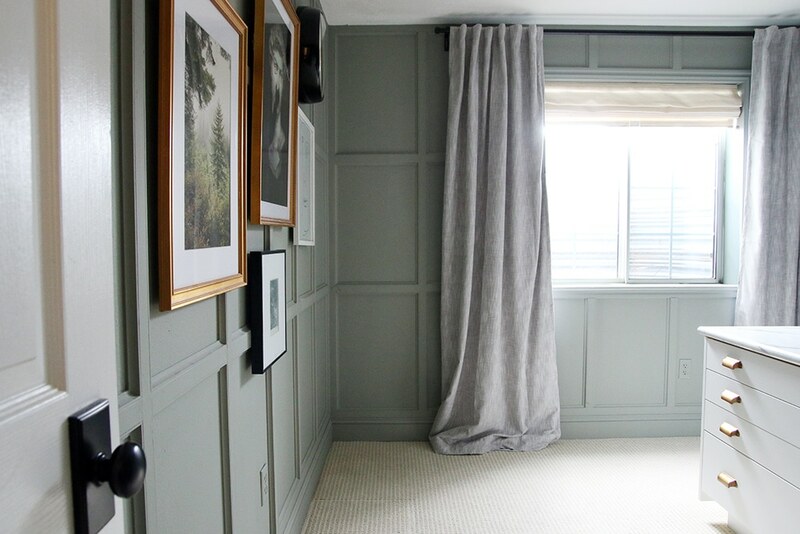 the changes look great…i love the gallery wall and the added curtains, especially! i will say, though, i’m surprised to hear you say how comfortable the west elm chairs are! i sat in one at our local store not too long ago and had the exact opposite thought: i thought it was wayyyyyyyy too uncomfortable(especially considering the price!). very interesting, but i’m glad they are a good fit for you! wish they could have worked for me, too. Have you done a blog post on paint brands? I know it’s scientifically impossible to exactly match colors from different brands, but I was wondering in your professional opinion (and since you have such a good eye for these kind of things! ), how different would the room feel with Sherwin Williams paint color-matched to the F&B Pigeon? There’s quite a price difference and I’m wondering if it’s worth it for a room. Or painting furniture. Thanks! Thanks – I did listen to the podcast! But YHL hasn’t personally used F&B that I remember. Thanks, Julia! Yeah, it makes sense about being a little flat. Christina, from what I understand what you’re paying for with F&B is the pigment. Much, much more pigment. You can colour match with another brand but they’ll never have as much pigment in their paints. This is more obvious with their full on colours as opposed to pastels, but perhaps even the pastels have more nuances with F&B, changing with light, time of day, season etc. It’s all light really! Originally, the advantage of a F&B colour was that no matter what you chose, even if it turned out differently from what you expected (and when doesn’t it? ), it was nevertheless a beautiful colour. They were historic colours carefully chosen and collected from British stately houses. Slowly and over long periods of time. The colours were also best suited to cool Northern European light. Not full-on Mediterranean light. In sunny Spanish or Italian houses, the subtleties of colour would be washed out by the strength of light (with the possible exception of north-facing rooms). So the higher the latitude, closer to the UK’s, the better. The company was sold however, and for the last little while they’ve been adding different colours each year, retiring others, and aggressively marketing in North America. Some of the recently added colours are from the ’60s, definitely no guarantee of beautiful walls any more. 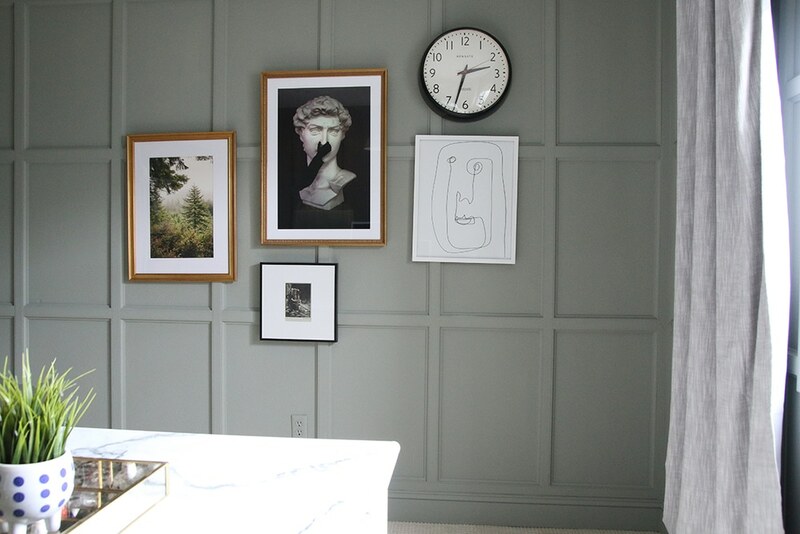 Another thing to remember, is that their emulsion for walls, as opposed to eggshell, is very chalky. This can be lovely, but it does mark easily. In Julia’s office the F&B works to advantage, presumably eggshell was used on the panelling and the cooler, indirect light really makes the colour look wonderful. But in a sunny south-facing room and in a flat finish on drywall, it could be a different story. Sorry for writing a novel here, but I painted rooms in our East Coast cottage, kind of on autopilot since we’d been using F&B colours for 20 years, in some of the same colours that looked so wonderful in our London house. I was shocked at how differently they read. A rather expensive mistake. So think carefully about which direction your room faces, which paint finish best suits your life and proceed from there. Use the tester pots. F&B paint, for us anyway, is longer an easy, automatic decision with a guaranteed outcome, unless it’s in one of the older colours… Best of luck. You gave such a detailed and great explanation, Marie — thank you very much! And such an interesting history lesson, too :) Especially since I live in the sunny, sunny south! It’s sitting in the hallway. I don’t know what to do with it! Wow, what a difference! I’m feeling the urge to put a big rug under that desk, though — maybe something with some dark red in it? Might not make sense with the chairs. I’m just craving a teensy bit more warmth in here. If not the rug, maybe a wooden plant stand? Ha ha, feel free to ignore this; you’re the experts! I LOVE LOVE LOVE everything you did with this room, it’s amazing how such small changes can have such a big impact on a room. How do you like the Mac mini? I’ve never heard of it until seeing this post and I’m intrigued! I’ve had a Mac mini for about 5 1/2 years and it was awesome. I just replaced it a couple months ago with a new iMac, but I probably could’ve put that off for another year or two. I work as a graphic designer and used the mini as my backup machine at home, so it got more than it’s fair share of use over the years. One thing I want to point out though is that the Mini’s haven’t been updated since 2014, so I would look into buying a used one if I was purchasing one at this point. If you want to upgrade the RAM yourself you’ll need to look for an even earlier version (2012 maybe? ), as the 2014 Mini’s have the RAM soldered in. I think the changes look great! This room is so serene and cozy, I imagine it would be a great space to work. I think the room looks SO much bigger with the lower desk! Like, CRAZY bigger. I can’t believe it…and yet, it’s so obvious. Yes!!! So much better – I love how you worked with what you have, and it seems like it would be far more comfortable now. This looks so great. I love updates on how things actually work. BTW, what about a Willow update, she had a spell where she wouldn’t come back indoors, how did you resolve that? Great office! She actually just got out last night! It’s getting faster and easier to get her back inside, but still a little bit trying. She has free reign of the backyard with dog door access, so she spends almost all of her days romping around in the snow. Yet, if the girls leave the front door open for a second too long she bolts! She doesn’t run away, just sits in the front yard watching and refusing to come back in. She’ll only start to run if you try to catch her. We’ve learned it is a big game for her and actually going out and, not trying to catch her, but to just play with her is the only way to eventually be able to grab her collar. She’s so silly. My dog growing up was impossible to catch when she was off a leash. Chasing her did nothing but made her run because, like you said, it was all a big game to her. What DID work, was saying “Bye, Emma!” and running the opposite direction. She would run as fast as she could to catch up with us and then we could easily put the leash back on her. I wonder if something like that would work with Willow? Another trick I learned (dog rescuer here) is laying down on your back in the grass – just starfish out. Most dogs will be curious enough to come over and see what this crazy human is up to. So much better! Not that the before wasn’t great, but that standing desk was a pretty imposing looking piece of furniture in the middle of the room- this feels much more comfortable.